God said, "Let there be light", and there was. "Let there be earth", and there was. Is Christ reigning on David's throne now? Is the soul immortal? Edward White's "Life in Christ"
One of the greatest puzzles connected with the Creation story in the first chapter of Genesis is the identity of the 'firmament' that God made on the second day. 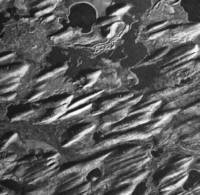 Transverse drift ridges--giant current ripples? The Mammoth and the Flood - a review of Howorth's book. 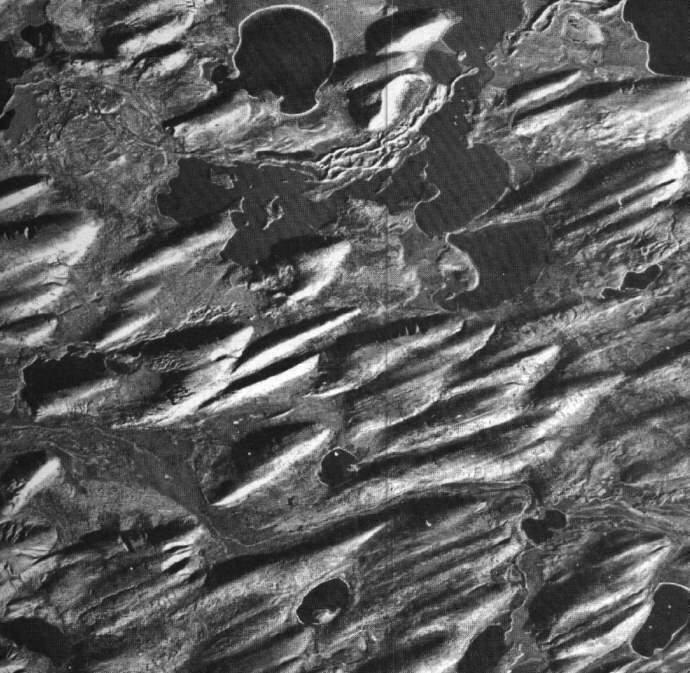 Drumlins: could a glacier do this? Sir James Hall of Edinburgh proposed a diluvial explanation of drumlins in 1814. The diluvial explanation of drumlins seems to be long overdue for a comeback. Conventional geology says patterns of stratification in sandstones are invariably sedimentary. Vertical pillars in the Potsdam Sandstone [Cambrian] near Kingston, Ontario are an enigma for conventional geologic theory; they transect the horizontal strata so the assumed sedimentary origin of patterns of cross strata seems flawed. An alternative explanation for patterns of cross stratification in sandstone is that these patterns may have formed due to a crystallization process, that produced sand in successive layers. According to this theory, the material which crystallized, forming sand or sandstones, was probably hydrous amorphous silica. Hematite coatings on quartz sand grains may have formed by exsolution. 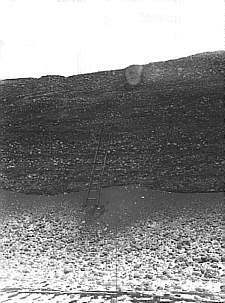 This process, of course, is not observed occurring anywhere in nature today, but may have operated in the past, in former conditions, as pressure was released due to erosion of overburden caused by rapid currents generated by differential crustal uplifts as the flood waters retreated from the land. The currents flowed away from centers of uplift. 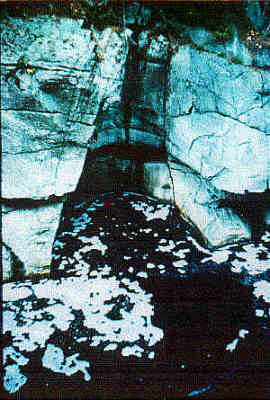 According to this theory, the vertical pillars were formed as the crystallization penetrated downwards in small areas; the adjacent rock was subsequently altered by the same process, generating patterns of cross strata from the top down. How could potholes have been formed in the sides of steep cliff faces? Can vortices in streams drill down into hard rocks, and form spiral-shaped potholes? What about potholes that intersect - how could the currents of the hypothetical vortices circulate, if a wall of the pothole was missing? Conventional uniformitarian theory, that claims eddys in streams drilled deep holes into hard rocks of stream beds or vibrated "grinding stones" at the bottom of depressions in the rock, that gradually wore deep vertical holes into the bedrock, does not account for these features of potholes, but they are easily explained by a theory of in situ disintegration that occurred in small, round areas, and progressed vertically downwards towards regions of higher pressure. This may have occurred in former catastrophic conditions, but is not occurring anywhere today. The process penetrated downwards, forming vertical cylindrical holes filled with the disintegration product, usually sand and pebbles, which are rounded due to concretionary development. In the drift gravel of Southern Ontario and elsewhere, cylindrical structures are sometimes seen exposed in gravel pits. One of these cylindrical structures is exposed at the top of the gravel in the photo above. The structures resemble potholes in shape; they occur in clusters like potholes; they have about the same variety of sizes as potholes; some show concentric internal structure in the arrangement of pebbles. 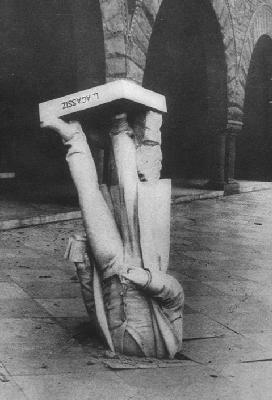 The presence of cross stratification has been reported in some. These cylindrical structures seem to indicate that the drift gravel was not deposited by ice sheets, or in streams flowing away from ice when it melted, but has a non-sedimentary origin; it can be explained as the product of an in situ disintegration of bedrock during the elevation of the continents at the end of the flood. According to this explanation, the disintegration penetrated downwards to varying depths and formed the mantle of drift. 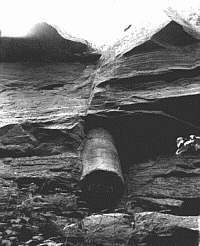 Pillar structures in drift, and the ones in sandstone, shown above, resemble potholes in shape, and in their distribution patterns. Sometimes potholes are discovered near sandstone pillars. Patterns of cross strata in sandstones and in the pillars are interpreted as non sedimentary in this article. William R. Corliss reprinted this article in his handbook of geological enigmas, Unknown Earth, and portions of it again in his 1990 book Neglected Geological Anomalies p. 224-225, where he also cited objections by E.J. Butler and F. Hoyle to the idea of glacial movement over vast distances that has been invoked in the glacial theory. Corliss wrote in his introduction to the article, "Most readers should find the following survey paper stimulating, comprehensive, and well-referenced." Abstract: The drift phenomena around the world have been interpreted by modern geologists in terms of tbe Glacial Theory. A great many problems of a fundamental nature are involved in this interpretation. The cause for the ice ages has not been determined. The distribution of the drift has given rise to numerous complicated and unlikely theories of events in the earth's past. Movement of great ice-sheets, necessary for a theory of distribution of the drift by ice-sheets and for the formation of streamlined landforms in a glacial environment, is postulated through some unknown mechanism. Mysteries abound in the glacial explanations of drumlins, kames and eskers, the formation of stratified drift, and ice-disintegration features. Fossils of the Quaternary include mammals not usually associated with cold climate. All of these facts suggest that the reality of the ice ages has not been proved. The gorge of the Niagara River has a complex history. During construction of a railway bridge in the Whirlpool Rapids groge, drift gravel was found deep below the present Niagara River, beneath the talus blocks that have fallen down from the sides. Before this discovery, geologists had assumed the gorge had been eroded by a progressive slow retreat of the falls upstream, due to a "sapping" process at the falls, which undermined the harder dolomitic limestone above softer shale and sandstones, leading to periodic collapse of the limestone. Clearly, the discovery of drift gravel below the river bed proved the gorge was not formed by this process, but indicated the river had merely removed unconsolidated drift gravel and sand, like that which remained below the present river bed. This erosion could occur in a much shorter period of time than the age Charles Lyell and others had proposed, for the time required for the gorge to have formed. Lyell's estimate was approx. 35,000 years. Nevertheless, at the Canadian Falls, a "sapping" process does cause steady retreat of the falls upstream, by collapse of the hard Lockport Dolostone as the softer shale and sandstones below are eroded. 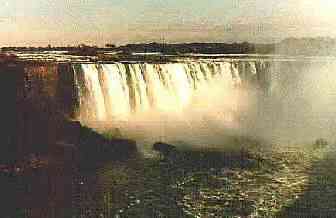 At least five cataracts, similar to the present one, spilled over the Niagara Escarpment, before the present gorge was excavated. Evidence for these former outlets exists at Holley, Medina, Gasport, Lockport, and Lewiston, all in NY. Conventional theory says these outlets were associated with an ancient lake called Lake Tonawanda; this lake probably existed for only a brief period during the drainage of a former much larger Lake Erie, as the land was uplifted. The drainage from the Lake Erie basin became confined to its most westerly outlet as the Niagara gorge was excavated. 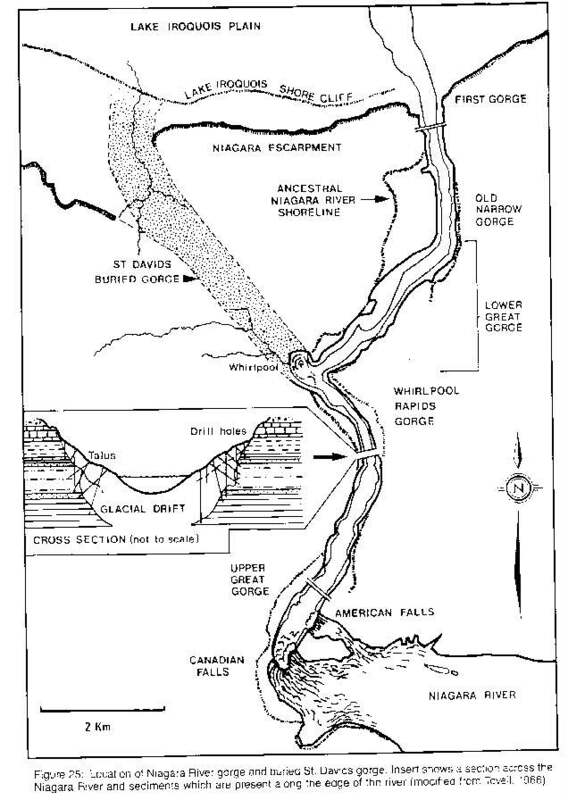 Most of the present gorge was probably eroded by a much larger volume of water than the present Niagara River. Traces of the former river bed can be found at various sites, high above the present river; for example at Niagara Glen. Smeaton Ravine, on the Canadian side, was the site of a small, temporary waterfall, 46 m wide. This torrent eroded a gorge 152 m long, and emptied into the Niagara River. The former more powerful currents probably eroded most of the gorge in a relatively short time span. Conventional theory says a pre-glacial river eroded the upper part of the Niagara River Gorge, and the St David gorge, but this gorge was filled up with glacial drift by the glaciers. The pre-existing channel was partly re-excavated by the existing Niagara River. A new alternative explanation is that the drift within the Niagara Gorge was formed by an in situ disintegration process, during the retreat of the flood waters, when the basins of the Great Lakes were excavated by the fast currents generated by tectonic movements. This unconsolidated drift sand and gravel of the Niagara Gorge was excavated by retreating flood waters that drained the Lake Erie basin. At the Whirlpool, the course of the ancient drift filled valley split; one part was excavated by the currents, and the other remained unexcavated. The filled valley, 300 m wide and about 90 m deep, is the St. David buried gorge. [ See map .] Well log data indicates other similar buried valleys occur below the surface in the area of the present town of Niagara Falls in Ontario. Some of these are upstream from the site of the present falls.